Hoya that blossoms in numerous captivating bicolours! 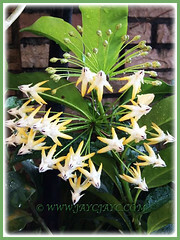 An enduring vine or creeper, Hoya is floriferous. 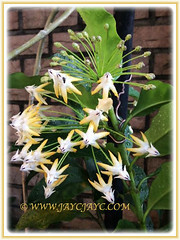 Our first sight of these gorgeously flowering vine was in November 2011 at our neighbourhood, in a plastic hanging pot. Next sight was at the Lavender Garden when we holidayed in Cameron Highlands early this year, in February 2016. It was grown on a trellis with the captivating bicoloured blossoms hanging downwards to show off and entertain us. After much googling, we’ve happily nailed its ID as Hoya carnosa cv. Red! Botanical Name: Hoya, followed by its species name. Common Names: Wax Plant, Waxvine, Waxflower, Porcelain Flower. Etymology: The genus name Hoya, was named by botanist Robert Brown, in honour of his friend, botanist Thomas Hoym. Plant type: An ornamental, evergreen and perennial creeper or vine. 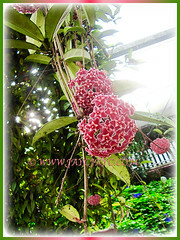 Features: The genus Hoya, is a one of the most showiest tropical plants that consists of about 200-300 species.The species Hoya carnosa has been in cultivation for more than 200 years and numerous cultivars have been produced with variable flower colours and foliage form, including variegated ones. A medium- to fast-growing perennial with climbing or trailing stems to assist its growth to 1-18 m across. The vine will be covered with simple, entire and succulent leaves that are arranged in an opposite pattern. They do vary in foliage form and flower colour. The showy flowers are generally star-shaped, with five thick, waxy, triangular petals and topped with another star-shaped structure known as the corona. As an inflorescence, they form an impressive umbel in ball-like formation, measuring from 4 to 12 cm in diameter. 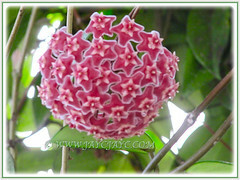 Hoya plants are commonly known as Wax Plant because their flowers and leaves look like they are carved from wax. 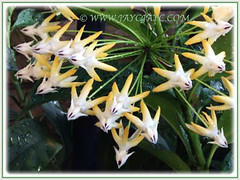 Truly unique, the flowers seem to be made of porcelain, hence one of their common names is Porcelain Flower. Colours are variable and bicoloured, ranging from white to pink, yellow to orange, dark reds to almost black and even green ones. 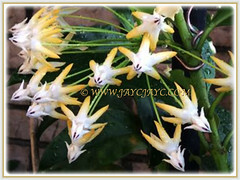 Most of the flowers are sweetly scented and produce nectar abundantly. They are pollinated by insects such as moths, flies and ants. Eventually they produce seeds in twin pods and are dispersed by the wind. 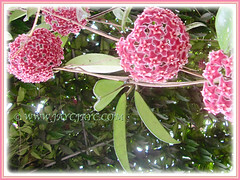 Culture (Care): Hoya or Waxflower grows easily with least maintenance. Light: Preferably bright indirect sunlight throughout the day and can daily tolerate 2 to 4 hours of direct sunlight. Semi-shade location is okay too. Moisture: Moderate water requirement. Water the plants when the soil dry a little more before watering it again. Best to use water that’s free from chlorine which had been allowed to sit for 24 to 36 hours. Hoyas benefit from regular misting to maintain sufficient humidity. Soil: Can be grown in any pre-packaged, all purpose houseplant potting medium and added with plenty of perlite. This will lighten and ensure the soil is fast drainage and well-draining as Hoyas are very sensitive to too much water. Others: Don’t remove the spent flower stems after blooming as it will produce flowers on those stems again the next time it blooms. However you can prune the plant lightly to keep it tidy. Hoya prefers to be potbound. So, keep them in a small pot to encourage and hasten flowering. Feed it monthly with a balanced liquid fertiliser suitable for epiphytic plants and occasionally use a fertiliser rich in potassium and phosphorous but low in nitrogen. Generally free from serious garden pests and diseases, though may be susceptible to stem and root mealy bugs. For subtropical and temperate regions: Hardiness: USDA Zone 9 to 12. 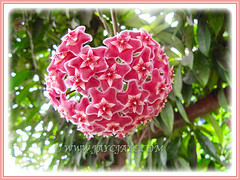 That means that Hoya plants can be grown outdoors as they can withstand temperatures that dip down to -7°C though they are mostly grown indoors as popular houseplants.Hoyas need to be watered more often during the spring and summer seasons while they are actively growing and less often during autumn and winter. Feed every two months in spring and summer, using a fertiliser rich in potassium and phosphorous but low in nitrogen. Blooming time is in summer. Propagation: Can be propagated from stem cuttings or by air layering. Place a portion of the stem with one or more pairs of leaves in water or damp soil and it will produce roots quickly. It can be propagated from seeds too. 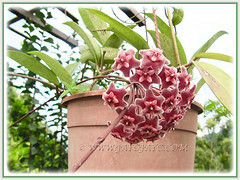 Usage: Hoya or Wax Plant is an excellent ornamental vine for any garden outdoors, and indoors as favourite houseplants. Ideal too if planted in hanging pots or baskets. Grow this captivating and floriferous vine with showy waxy flowers, cascading on fences, trellises or train it to climb over trees. 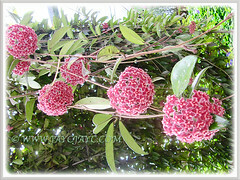 Plant Hoya carnosa to remove pollutants inside your home environment, as mentioned by University of Georgia. White Phalaenopsis Orchid cv. aphrodite is super pure in colour!